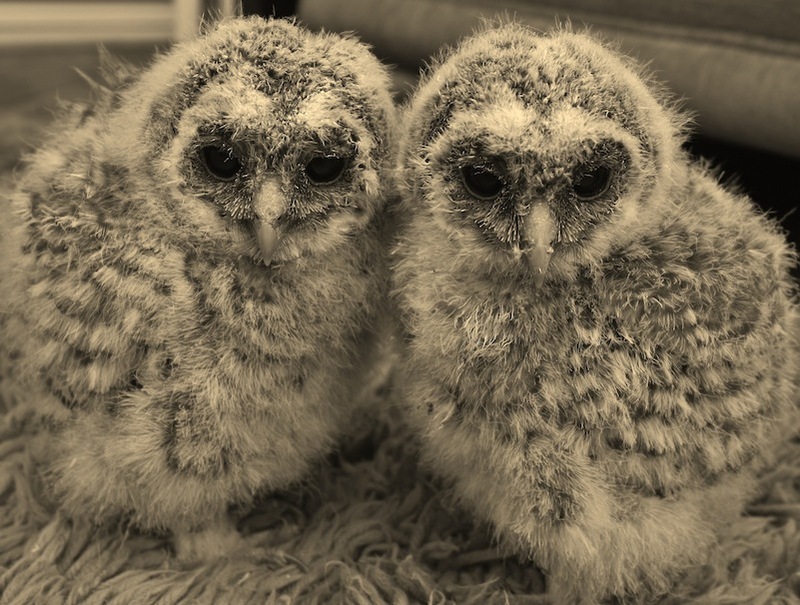 It has been 6 weeks since we brought the two baby Tawny owls home to live with us, and a lot has happened since then. 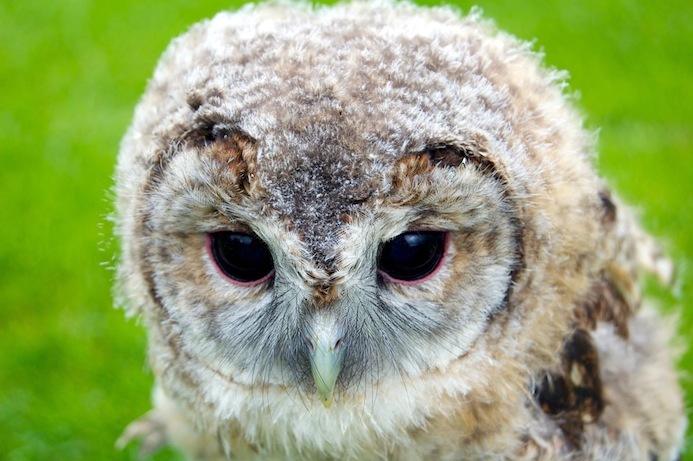 It has taught us a lot as volunteers about Birds of Prey, and in particular the Tawny Owl. Sebastian is weighing in now at 12lb 8oz and Oly is 14lb which almost confirms that she is a female, making Seb and Oly brother and sister. They have become proper little characters. During their first week with us they enjoyed Britain’s got Talent on TV, sitting quietly on their small perch like two old women, wrapped up in their fur coats and scarves at the cinema. Oly is the more vocal of the two and seems to like to relax watching the fish swim in the tank. When one falls to sleep the other keeps watch, which is quite a good little system they have going. After spending a day at the centre meeting up with Gizmo (the baby great horned owl) they had obviously learnt a new trick – how to jump. It’s like having toddlers all over again! Together they perfected the balancing act of sitting on a perch or glove, and walking for their food. They have learnt to associate the whistle and the glove with food, which has proved troublesome at times. They also mistaken shoes for the glove, and have gone towards Nigel when he has put on his black shoes for work, flying to his feet for a little bite to eat!! Progression over distance was made at about 5 weeks old. Learning to explore more Seb and Oly learned to jump from the settee to the floor for their food. Their twice daily feed was then cut to once a day to make sure they were hungry enough to work for it. We trained them by each time moving the goal posts further, to get them to fly to the glove. By the age of almost 6 weeks – our mission was almost accomplished! The 26th of May was their debut appearance at Brough Park in Leek at the Jubilee celebrations, being admired and cooed over by many. I think all the fresh air made them very tired after being used to spending their days in the house prior to the event. They then again appearing at the Well Dressing celebrations in Werrington. By now they had their furniture fitted (leather anklets), so they were now able to be taken outdoors safely without the fear of escape. They were now able to relax with the grown ups in the flying and handling team at the Keel University open day on their block perches. Over the time we had Seb and Oly, it became evident at feeding times that their eyesight seems almost non existent when close up. They appeared to have to feel for their food with their hairs located either side of the beak. However, we noticed that they have no problem seeing things such as aeroplanes high up or birds flying across the sky. I believe their sight is perfect at long distance. And finally, as their trip to boot camp, or stay with us, draws to a close. 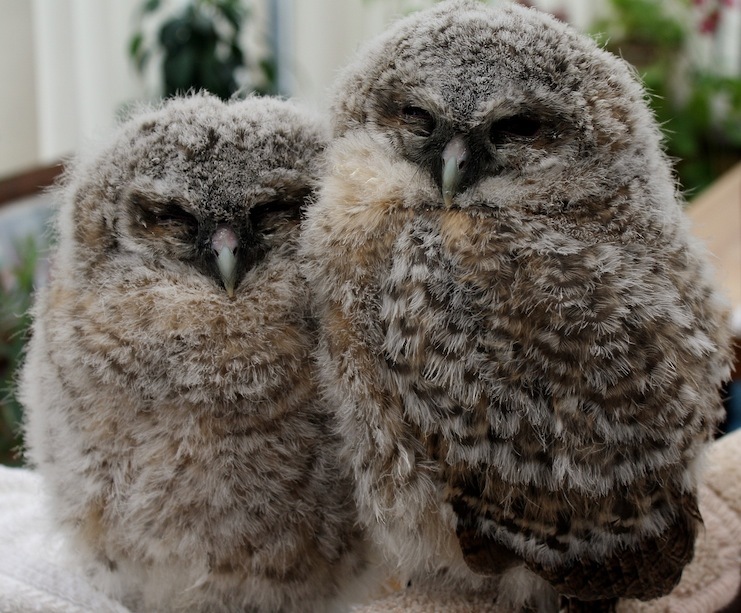 Their feathers have become more prominent, with mainly just their head and shoulders being the little fluff ball. This is always the last to become established, with these feathers being the last to develop so they are more recognisable as juveniles to the older birds. Flying to the Creance is now done on a daily basis with them completing 4 to 6 flights. Seb seems to be more eager, and fly the longest, while Oly likes to explore the great outdoors. We’ve not only learnt a lot but its also been an absolute honour and a great pleasure having them. We will definitely miss them when they are back at the centre, but at least we will be able to see them grow and progress even more to hopefully one day become part of the flying team, flying free and enjoying their independence. We’re hoping to keep you updated with their progress throughout and certainly before they return at the weekend to the Centre, so don’t forget to revisit our site for more news.